Home / Project Management / Direct and Manage Project Work Process: How to Ace in Project Execution? As defined in the CAPM certification training, the project has many processes, which comes one after another. After develop project management plan process, the project plan is approved and project kick off meeting is held. So now the project execution phase can start! Direct and Manage project work process belongs to project integration management knowledge area. It mainly deals with successful management and coordination of project management plan activities. The objective is to complete the project as planned and to meet the project objectives. Now let’s find out what is the objectives, the inputs and the outputs of Direct and Manage project work process. You can find further information about this process in PMP courses and test your knowledge with a PMP practice exam. What is the main purpose of direct and manage project work process? Direct and Manage Project Work Process is the integration part of executing process group. 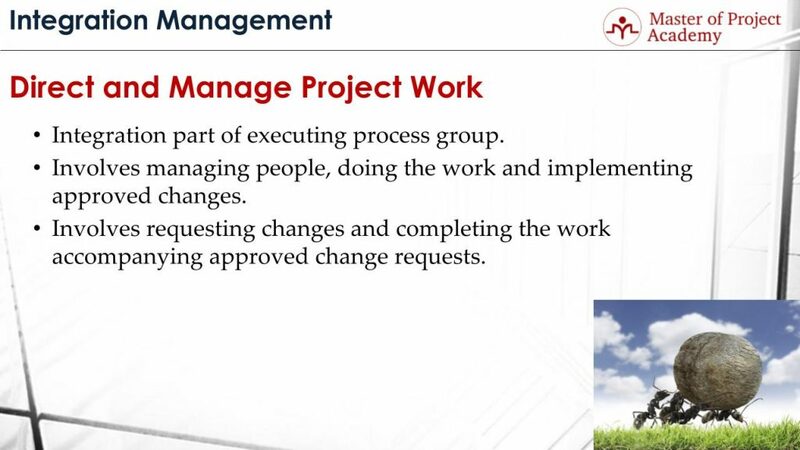 There are lots of executing process group activities and processes under each project management knowledge area. 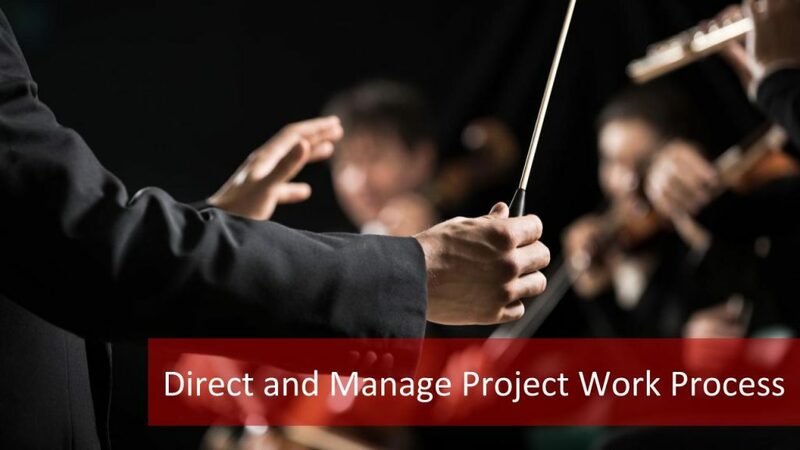 The main purpose of the direct and manage project work process is coordinating these activities and processes to produce project outputs as planned. 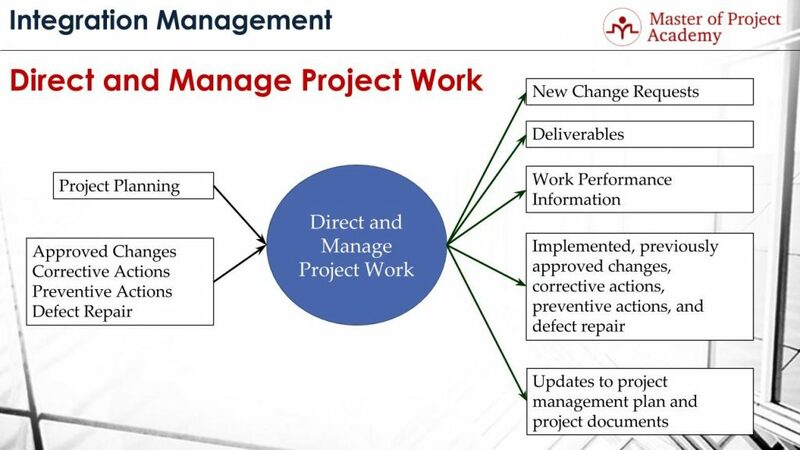 What is involved in direct and manage project work process? Direct and Manage Project Work process involves managing people, doing the work and implementing approved changes. Project management plan activities are performed during executing phase and this is mainly ensured with the help of Direct and Manage Project work process. If there are variances from the planned values in the actual results, change requests might be raised. If these requests are approved, they are implemented with the help of direct and manage project work process. Direct and Management Project work also involves requesting changes and completing the work accompanying approved change requests. If there is a variance that needs to be corrected or there is a defect, request change is done in this process. For instance, let’s consider that your actual results show that you are 10% behind of the planned schedule, and you will exceed the project budget by $30,000 once you completed the project. These variances must be corrected and a revised plan must be produced to accommodate these variances. Another example; let’s consider that the scope of the project is to develop a custom software for a customer. During the acceptance tests, the customer finds an issue that does not meet their requirements. If this requirement was in scope but could not be delivered properly, this is called a defect. This kind of corrections for the project variances and defect repairs are implemented during direct and manage project work process. What are the inputs of direct and manage project work process? Now, let’s see what can trigger the start of direct and manage project work process. The completion of project planning process is the major input for starting direct and manage project work process. Because, once the project plan is finalized, the executing process group starts to implement the project activities which are planned in project planning. So, Direct and Manage Project work process is triggered. This process will trigger other executing processes of other knowledge areas to complete the project work successfully. Another input to start Direct and Manage Project work process is Approved changes, corrective actions, preventive actions and defect repair. If a change is approved by the change control board, implementation of the approved change is executed by the Direct and Manage Project Work process. Briefly, corrective action is taken for the variance that happened already, preventive action is taken for future risks to reduce their impacts and defect repair is done for the problems identified during quality assurance, for instance in testing. What can be the outputs of Direct and Manage Project work process? Now let’s explore what direct and manage project work process can trigger throughout the project. New change requests: During executing project activities, the customer might come with new requirements or their existing requirements might change. In this case, the change request is submitted as per in the requirements management plan and evaluated by the change control board in accordance with the Change Management Plan. If it is approved, then this change is implemented in Direct and Manage Project work process again. Deliverables: The main purpose of the direct and manage project work process is producing the planned project deliverables and final product of the project before the project closure. Work Performance information: While executing phase progress and deliverables are produced, actual results will not be exactly as planned. Some activities might take longer to complete while some activities are completed earlier. Or some activities might be costly than the planned values while other activities will spend less money. These actual results and produced outputs are measured against the baseline with the determined metrics to check how well project is progressing. Implementation of approved changes, corrective actions, and defect repairs are also outputs of Direct and Manage Project Work process. Updates to project management plan and project documents: Based on the actual results of the projects, implemented corrective or preventive actions and defect repairs, project plans might require revisions. Because to meet the project objectives, future activities of the project must be revised based on the results of the actual results. And this requires updates in project management plan and project documents. To sum up, Direct and Manage Project Work is the process which ensures that the many processes of the executing process group, during which the actual project deliverables are produced, are directed and managed according to the rules that defined in the PMI certification training.